Christmas is almost here! I’ve been so busy this year finishing up projects before the end of the year, I haven’t been baking nearly as much as I would like to. That’s what next week is for! 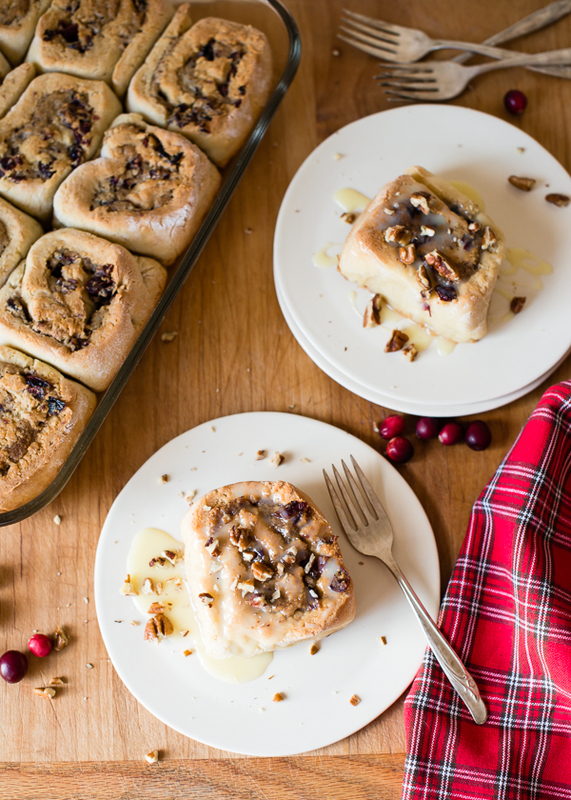 But just in time for Christmas morning, I’ve got a really good recipe for Pecan Cranberry Sweet Rolls with White Chocolate Glaze that I developed in partnership with Red Star Yeast. (I’ve loved working with them again this year!) 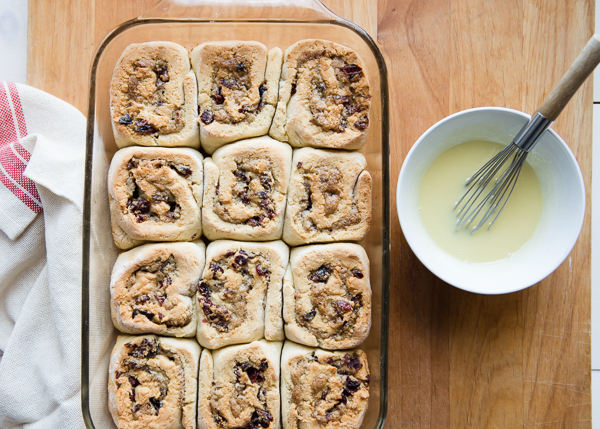 I think I kind of blew all the other sweet rolls I’ve made out of the water in one fail swoop with this recipe. It’s that good. 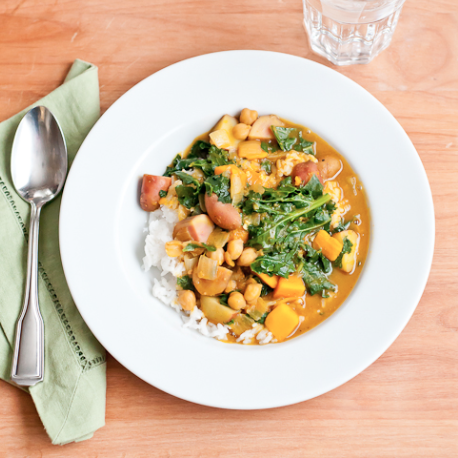 When I started out to develop this recipe, I was going to go in a completely different route. I’d been wanting to come up with a yeasted cranberry bread recipe that I could slice, toast, and eat with a smattering of butter. But then I thought back to the Gluten-Free Cinnamon Rolls I made last year and remembered how much we love them, and how long it’s been since I made them. 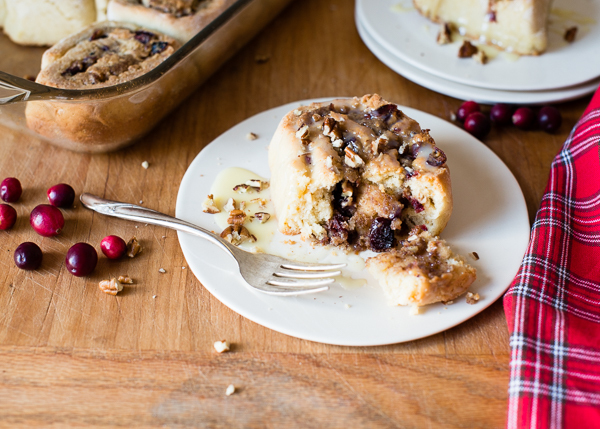 And then I thought, What I’m really craving is cranberry sweet rolls with pecans…and white chocolate. So, I decided to go that route because I’m itching for something new to serve for Christmas morning breakfast. 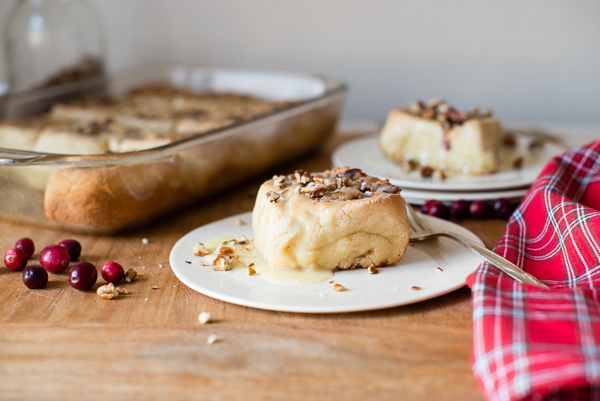 Though if I’m honest, we’ll probably eat cold cereal first thing, then I’ll get around to making these for brunch instead. (My family sort of expects that from me.) The kids and Dad play with the new toys, and I head into the kitchen to bake. I suppose that’s our Christmas tradition, and we all love it. As I said, the dough is very soft. 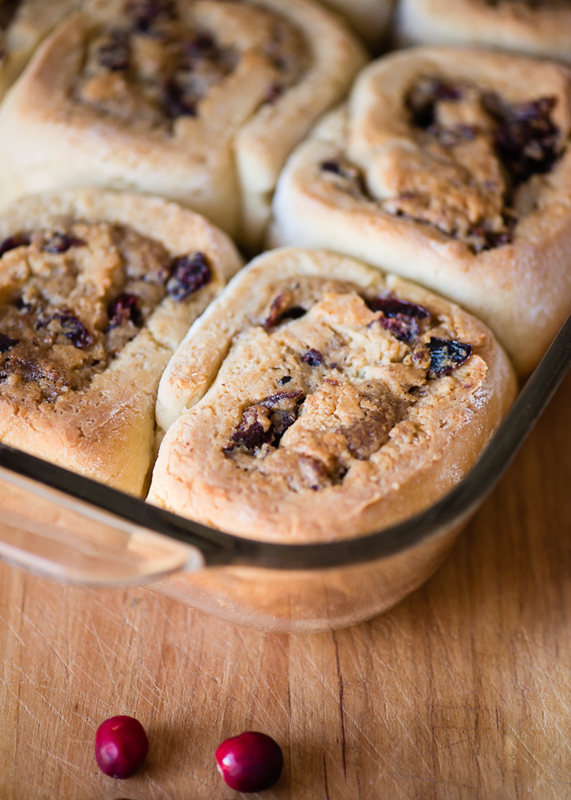 I left it that way on purpose because I feel like sweet rolls need to have a tender crumb. Because these rolls are gluten-free, the texture is somewhere between a yeasted cake and a biscuit. To keep them soft after baking, the dough needs to be very soft. It has a little more butter than I typically use for the amount of gluten-free flour, but it adds a richness to the dough – almost like brioche. 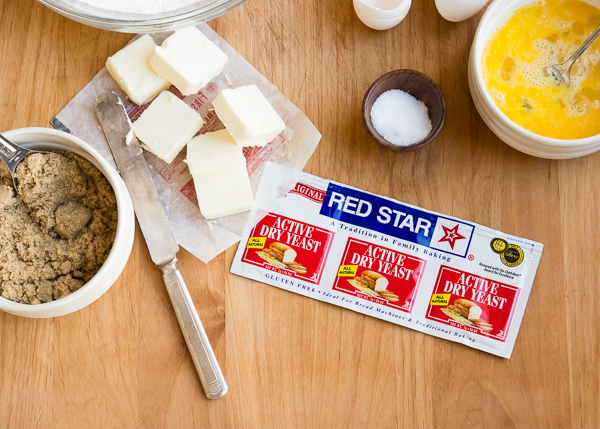 I like using Red Star Active Dry Yeast vs. instant yeast for gluten-free rolls because I like giving them the extra time to rise and develop more flavor. I used two full packets of yeast to give them a little extra lift. The combination of starches and flours can be a little heavy, so it needs the extra yeast. But the instant yeast can also be used and will make these even quicker to put together. Note: It might go without saying, but just make sure all of your ingredients are certified gluten-free, including the white chocolate, especially if you’re not GF and you’re making these for someone who is. 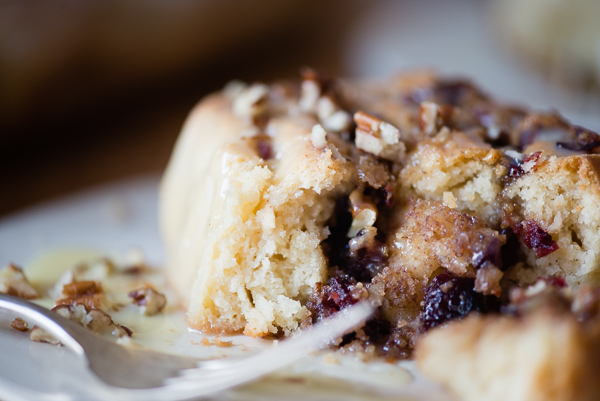 Tender, sweet rolls filled with pecan frangipane and chopped dried cranberries, drizzled with a white chocolate glaze. 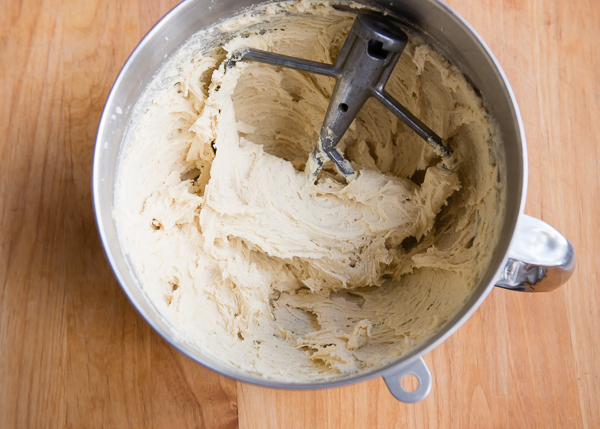 For dough - place the gluten-free flour mix and xanthan gum in the bowl of a stand mixer fitted with the paddle attachment. Mix on low speed for 30 seconds. Place warm water in a medium bowl. Sprinkle yeast over water along with the ¼ teaspoon sugar. Stir to dissolve. Let stand for 5-10 minutes, or until foamy. Meanwhile, in a medium pan, stir together milk, brown sugar, and salt. Add the butter. Heat over medium, stirring occasionally, until butter is melted, and sugar is dissolved. Remove from heat. In a medium mixing bowl whisk eggs. 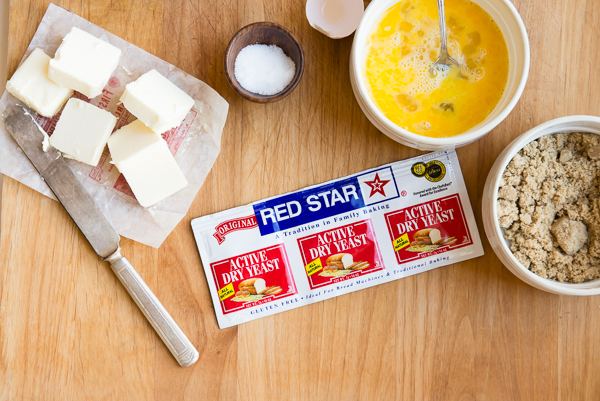 Pour the hot milk mixture into the eggs in a slow, steady stream while whisking. 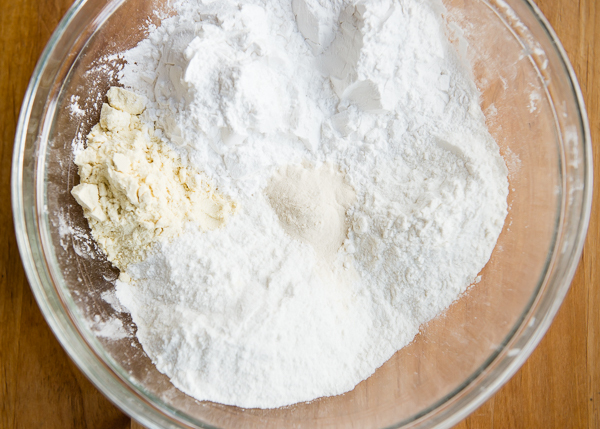 Turn the mixer with the gluten-free flour on to low speed. Pour the warm milk and egg mixture into the bowl with the mixer running. Add the yeast next. Turn mixer to medium speed and beat for 5 minutes. The dough will be pretty sticky. 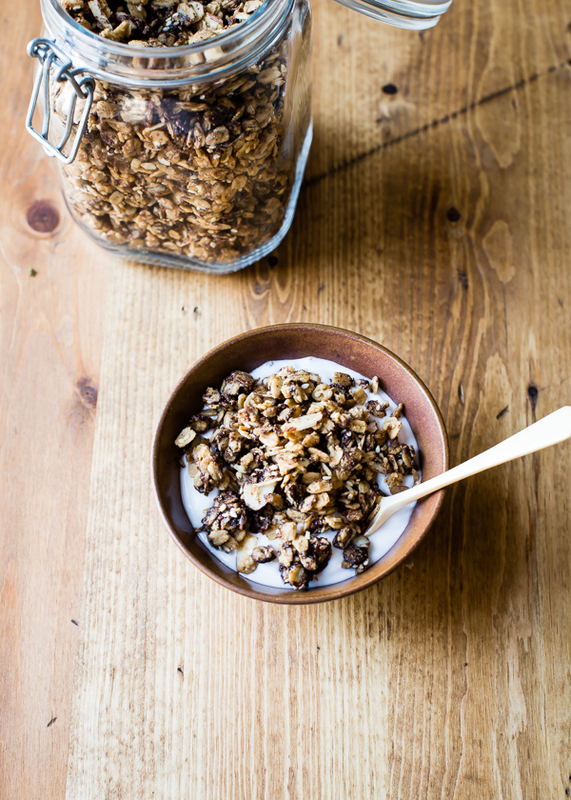 If it appears to be too dry, add a little warm water, one tablespoon at a time. Oil a large mixing bowl and transfer the dough to the bowl. Form into a ball and turn it over to coat the dough with oil. Cover and let rise for 45-60 minutes. 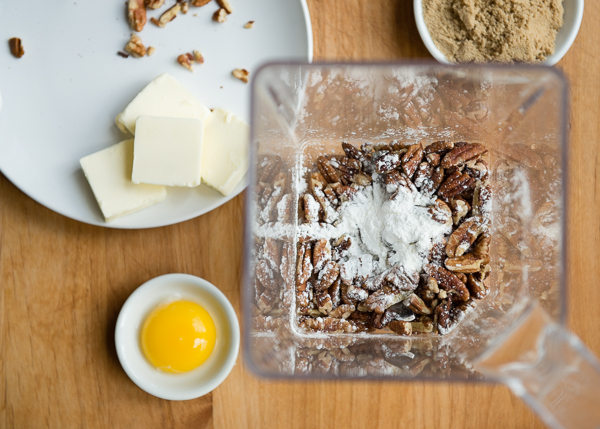 For filling - place pecans and cornstarch in a blender or food processor. 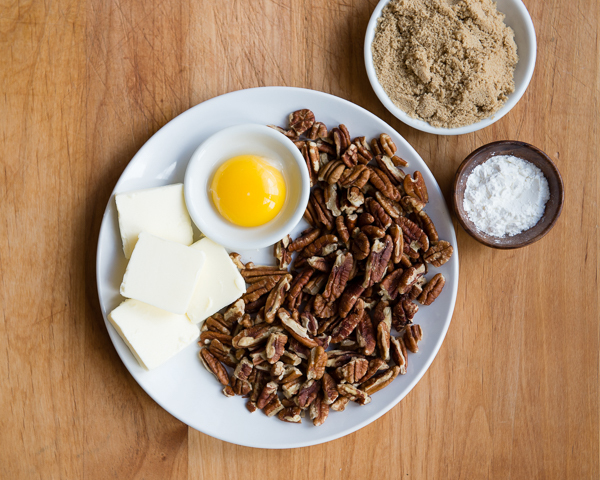 Pulse until pecans are finely ground. Add the butter, brown sugar, and egg yolk. Pulse, stopping to scrape down sides, until thick and creamy. Set aside until ready to roll out dough. 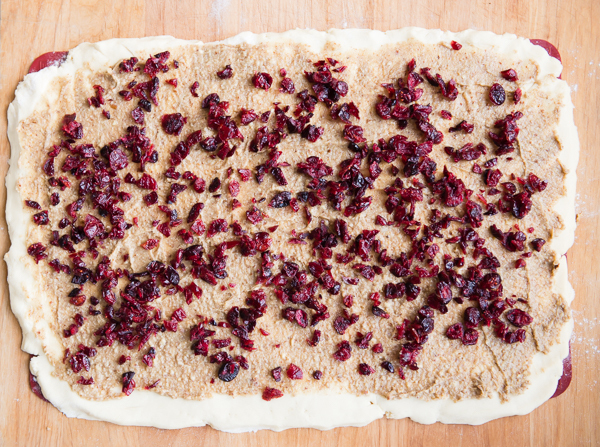 To roll out dough, lay a piece of parchment paper or silicone baking mat on a clean, flat surface. Sprinkle evenly with a little rice flour to prevent sticking. 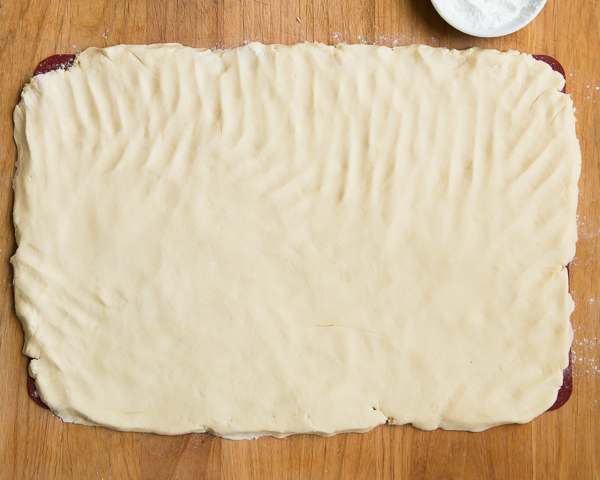 Transfer dough to the surface and press or roll dough out into a large rectangle, about 9- by 16-inches. Spread the pecan cream over the dough leaving a little bit of a border on one of the long sides. Sprinkle the chopped cranberries evenly over the pecan cream. 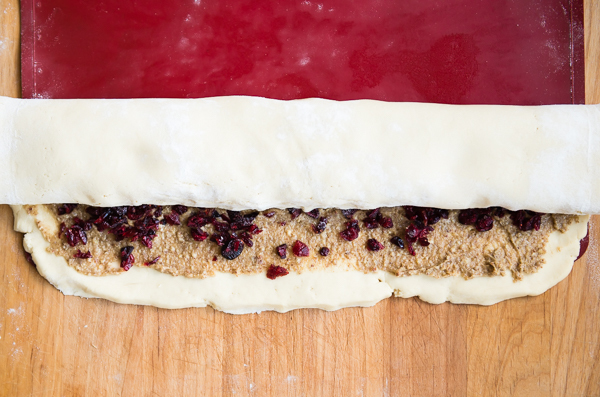 Starting with the long side without the border, roll the dough over onto itself using the parchment or silicone baking mat as a help. Gently press the seam to seal it. If it doesn't stick, use a little water as "glue." Butter a 9- by 13-inch baking dish. 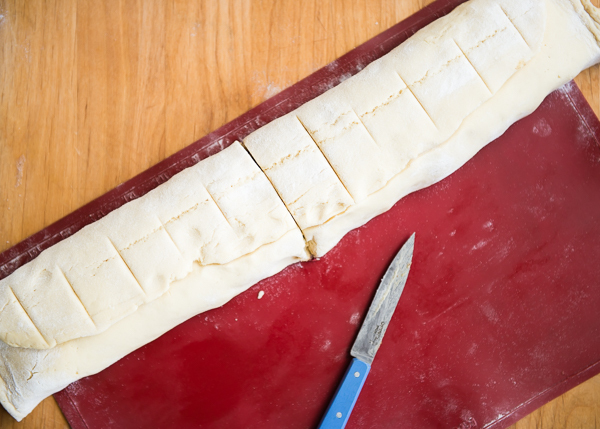 Using a very sharp knife, cut the dough into 12 thick rounds. 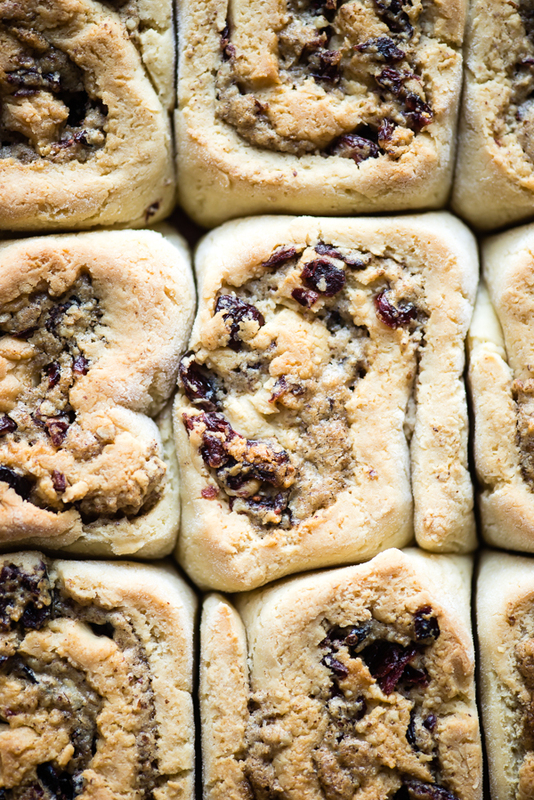 Arrange the rolls in four rows of three. Cover tightly with plastic wrap. Place somewhere warm and let rise for 30-45 minutes. Preheat oven to 400°F. Bake the rolls for 20-30 minutes, or until golden brown on the top and bottom. (A clear glass pan makes this easy!) Let rolls cool slightly while prepare glaze. For glaze - place white chocolate chips and cream in a microwave-safe bowl. Heat on 50% power for 30 second intervals until melted. Whisk until smooth. 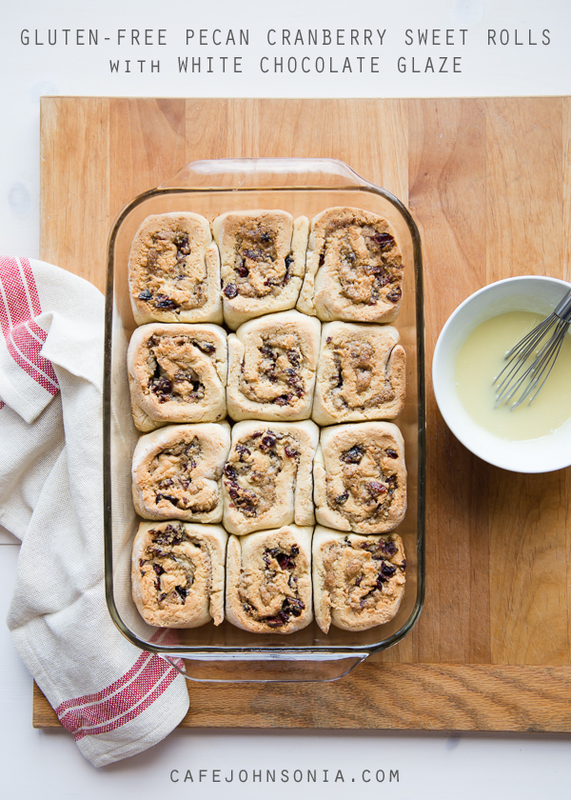 To serve - drizzle rolls with glaze and serve immediately. -Rolls are best served warm. To reheat, place in microwave for 10-15 seconds. -Store extra glaze in the refrigerator. Reheat for 10 seconds in microwave and whisk until smooth. Disclosure: This post was sponsored by Red Star Yeast. Thank you for supporting brands I love. All opinions are 100% my own. The gluten-free flour mix I’ve used includes a lot of “white starches” and flours. This helps lighten the dough so it rises higher. It also gives the rolls a really nice texture when baked. Brown rice flour can be used in place of the white rice flour and sorghum or amaranth flour can be used in place of the millet flour. The dough will be very sticky. It will set up as it rises and be more manageable to work with. 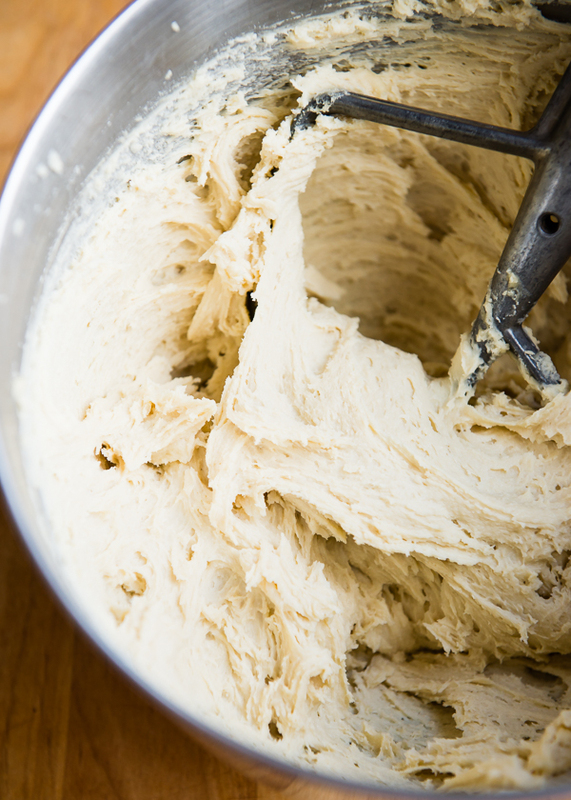 If the dough feels stiff rather than sticky, add a few tablespoons of warm water, one at a time, until it is sticky. This dough rises twice. It gives it great flavor and gives the yeast time to work its magic. It will not double in size, but it will grow a little bit. You’ll know it’s rising because it will smell yeasty. The filling is made up of butter, an egg yolk, pecans, brown sugar, and a little cornstarch. A blender or food processor can be used. The pecan cream (frangipane) is supposed to be pretty thick. Don’t be tempted to add more liquid to it. 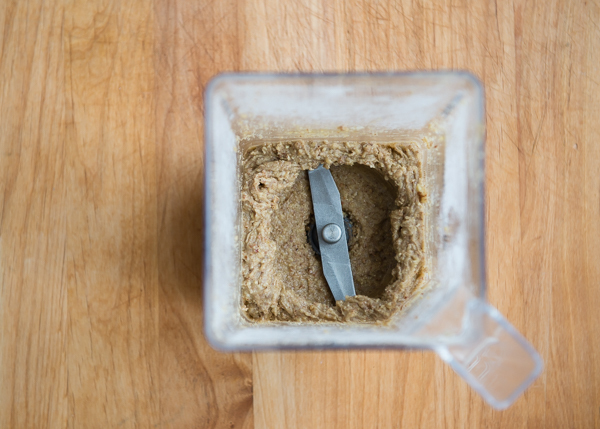 Stop and scrape down the blender or food processor often. I pulse the pecans with the cornstarch first, which helps them become more finely ground and eliminates cornstarch lumps. 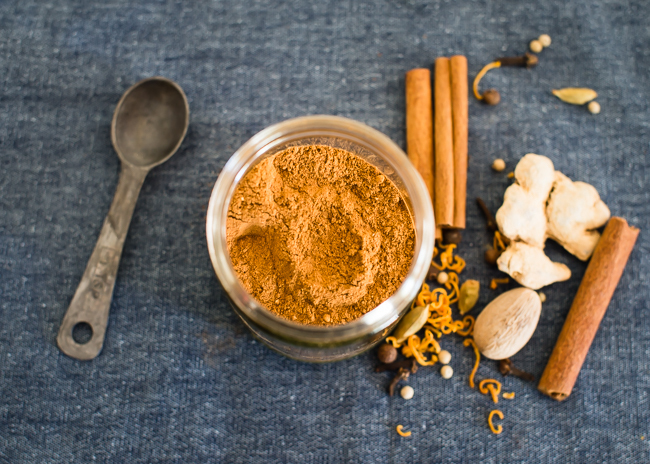 If you don’t have a blender or food processor, pecan meal or flour, or another nut can be used. The nuts must be finely ground for the filling to set up correctly when baked. The filling will have the consistency of natural peanut butter. If it feels too runny instead of being spreadable, place it in the fridge for 10-15 minutes and it should set up enough to spread. The dough is very, very soft. I didn’t even need my rolling pin to roll it out. 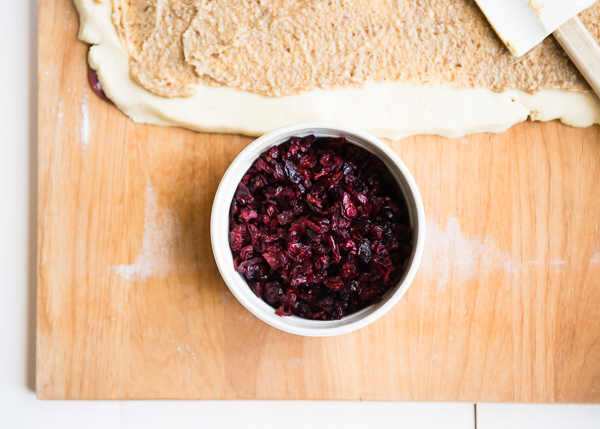 I like using a silicone baking mat or parchment paper to help me roll up the dough. Sprinkle the surface with enough rice flour so it doesn’t stick, but not so much that it dries out the dough. The dough shouldn’t need much. It’s pretty easy to pat out into a rectangle. 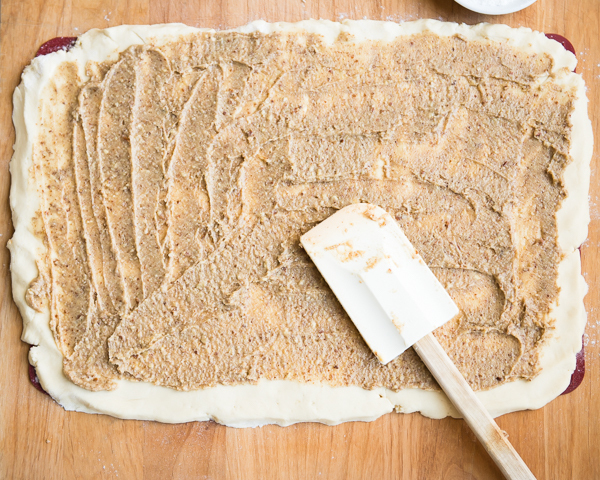 When spreading the pecan frangipane over the dough, be sure to leave a bit of a border, especially on one of the long sides to account for some of it oozing out as the dough is rolled. 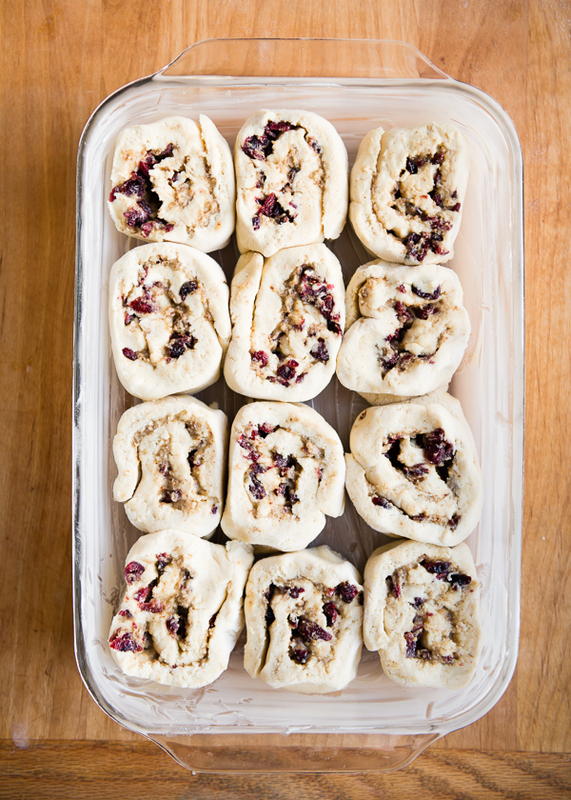 Chopping the dried cranberries makes it easier to cut the dough into rolls. 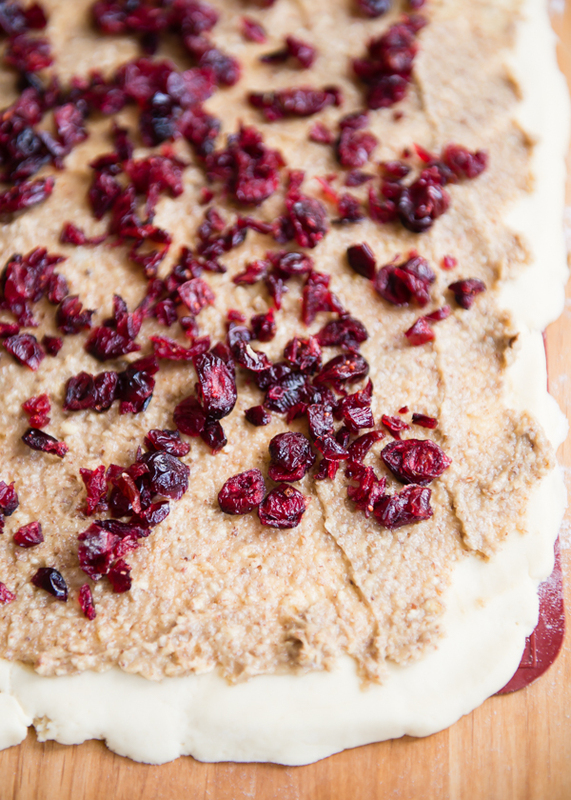 Other dried fruit could be used instead, but the tangy flavor of the cranberries goes really well with the pecan cream and the white chocolate ganache glaze. 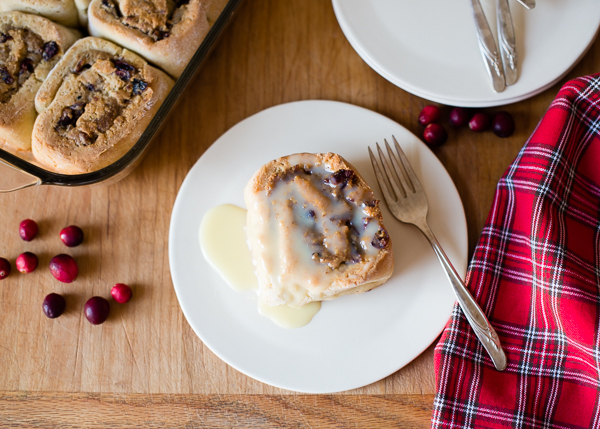 It goes without saying, but sprinkle the cranberries as evenly as you can so every roll with get some. 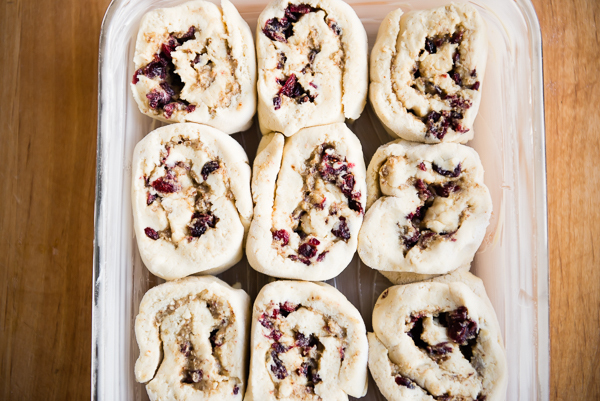 Start on one of the long sides and use the silicone mat or parchment to help you roll the dough. Try to roll it tightly so there are no gaps. 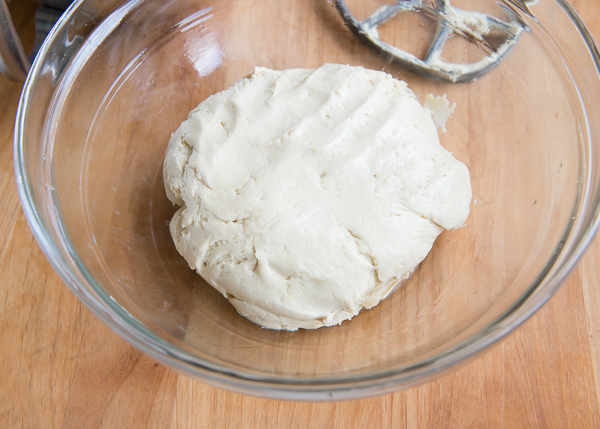 If the dough doesn’t seal onto itself at the end, gently brush a little water on the edge to act as glue. Pressing the dough vs pinching it will work better at getting it to seal. Cut the dough into 12 equal pieces. These are bigger rolls that end up being about 1 1/2-inches thick. Leave the ends a little thicker than the middle rolls and tuck in the edges. 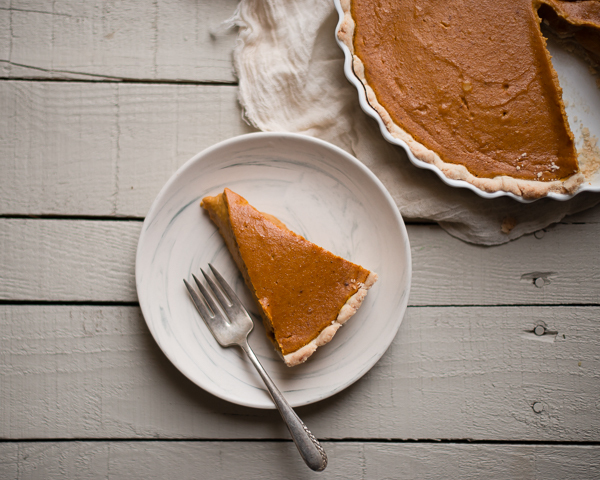 Use a very well buttered baking pan. Clear glass is preferred because it’s easier to see when the rolls have baked through on the bottom, which you want to be almost as golden as the tops. The glaze/ganache is very easy to make. I just put the white chocolate into a microwave-safe bowl with the cream and microwave on 50% power. It doesn’t need too long. Sometimes as little as 30-60 seconds will do it, or up to two minutes. Check after every 15-20 seconds to make sure the white chocolate doesn’t burn. Whisk until smooth and then it’s ready for drizzling! The rolls are at their very best right after baking, but will keep for several days wrapped well. The rolls and glaze should be kept refrigerated. To reheat, microwave the rolls for 10-15 seconds and do the same for the glaze. Drizzle the glaze over top and enjoy! These look great! 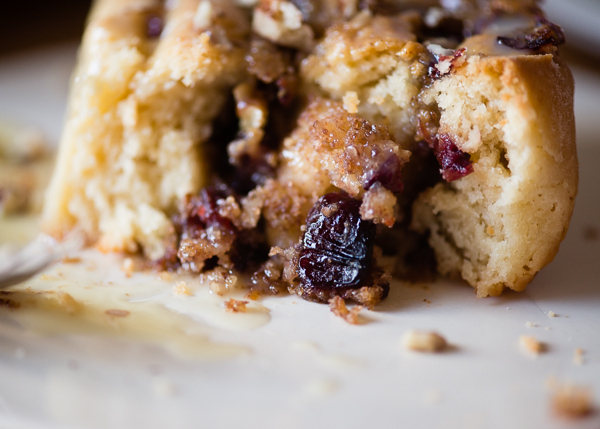 I made cranberry muffins a while back and I have to say I just love using cranberries in breakfast baking, especially during the winter! They’re the perfect accent to practically everything! Thank your very much for this recipe. These rolls look delicious. My daughter loves to bake but it is hard to find yummy GF recipes. My husband who is gluten intolerant is going to appreciate it!